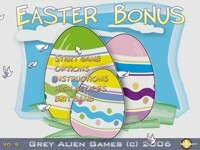 Grey Alien Games has been making downloadable PC and Mac games since 2004. Our catalogue includes mega casual hits such as Regency Solitaire, Spooky Bonus, Fairway Solitaire and Unwell Mel. Our site is packed with great games that you can try for Free. Please browse our site, download some games, and have fun! We are always delighted to hear from people who have played our games; so please send some feedback to info@greyaliengames.com - we'd love to hear from you!